These photos were taken at various times on March 5, 2014. 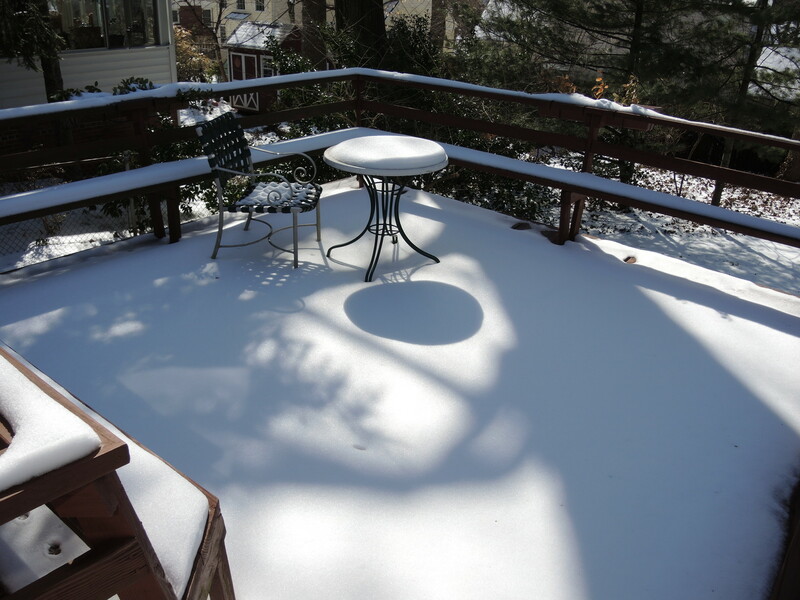 The location was on the back deck of my home in Bethesda, MD. The "Take it!" 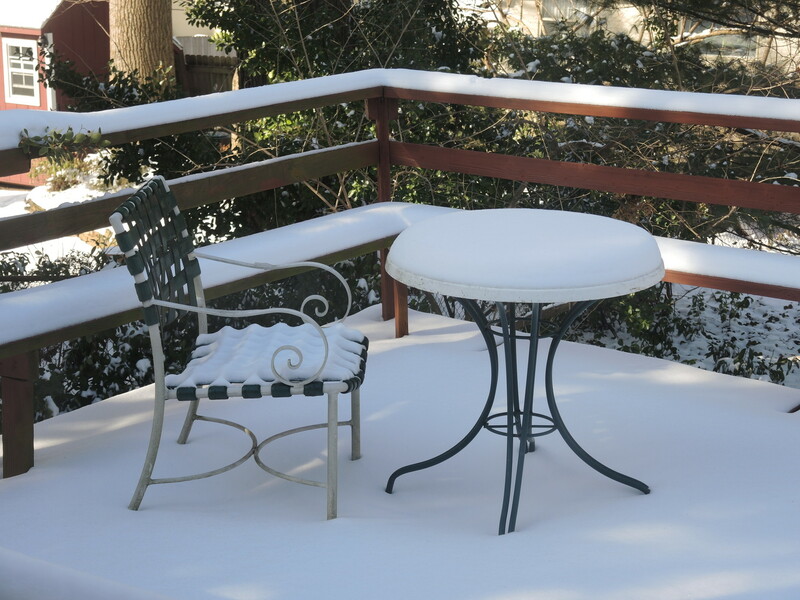 came from looking once again at the perfection of the circle of snow formed on the small table that stays on the deck all year long. There is just something about a nature enhancement to any object that attracts me. 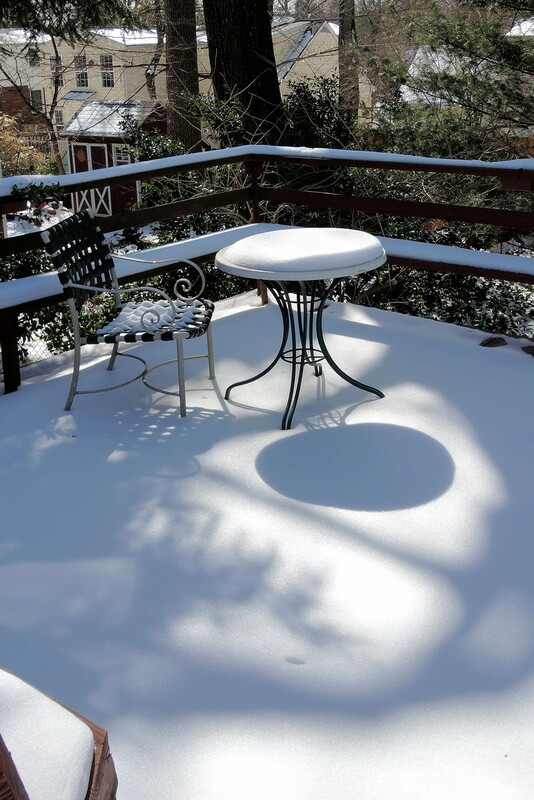 The upper photo was shot early in the morning with the sun not yet having fully arrived on the deck. At the time I took this early photo I did not have any particular plan to revisit this setting later. That changed in a big way - when I happened to take another look at this setting later in the day. What a difference the brightness of the sun can bring to anything. The additional textures of sun induced shadows add much in the way of depth and unexpected drama to the scene. The After Take: The people I have shown this series to, almost cannot believe that all the photos are of the same subject for the difference is ever so striking. I confess immediately that while the title to this photo imply's that I had a plan to visit it in the onset at a later time - that it was by complete accident that I did.go back. The lesson for me in this - is to try to look again - for often the shedding of a new light on a subject will have one seeing it quite differently. Here is hoping you are having a day, with some part of it, including some new light. Looks like you're getting a fair amount of snow. Beautiful photo, such a great view to look upon. Ya I'd have my afternoon tea inside that day. Awesome deck. Even though its not BBQ weather I'd imagine having some great parties out there. The snow looks so smooth and white. Has a nice soothing look to it, from inside of course lol.